Roy M. Unbehaun was born on 8 September 1903. He was the son of Charlie Unbehaun and Lillie Modena Baer. Roy M. Unbehaun married Elizabeth I. Pauls on 11 November 1925. 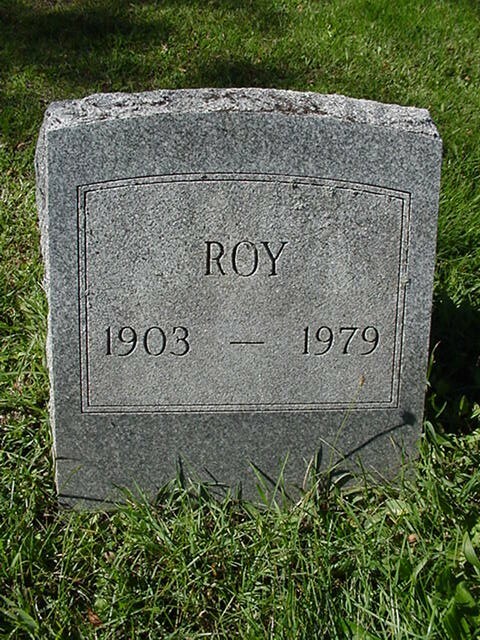 Roy M. Unbehaun died on 26 March 1979 at age 75. He was buried after 26 March 1979 at Richland Center Cemetery, Richland, Richland, Wisconsin. Catherine Elizabeth Unbehaun was born on 17 February 1910. She was the daughter of Charlie Unbehaun and Lillie Modena Baer. 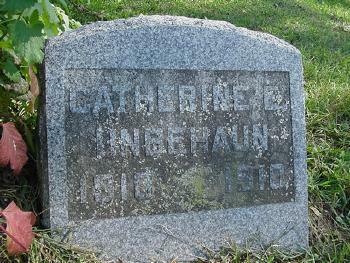 Catherine Elizabeth Unbehaun died on 31 December 1910. 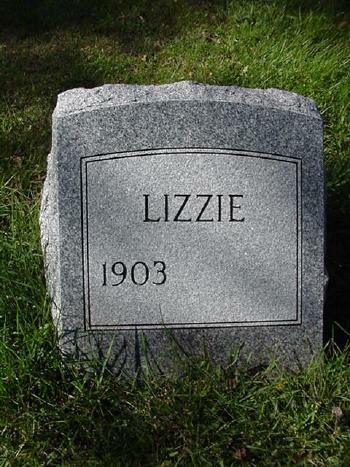 She was buried in January 1911 at Richland Center Cemetery, Richland, Richland, Wisconsin. Name Variation Henry Theodor Unbehaun was also known as Heinrich Theodor. Henry Theodor Unbehaun was born on 14 January 1827 at Germany. He was the son of Johann Nicol Unbehaun and Christina (?). 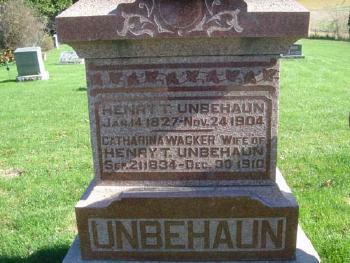 Henry Theodor Unbehaun married Catharina Sophia Wacker, daughter of John Phillip Wacker and Maria Elizabeth Hardt, in 1852 at Highwood, Illinois. Henry Theodor Unbehaun died on 24 November 1904 at age 77. He was buried after 24 November 1904 at English Ridge Cemetery, Marshall, Richland, Wisconsin. The English Ridge cemetery is not far from the Unbehaun farm. Henry T. Unbehaun, born January 14, 1827, and died November 24, 1904, is buried close to the gate by the side of his wife Kathrine Wacker Unbehaun, born Sep. 21, 1834, and died December 30, 1910. He was a native of Germany and came to America when he was 20 years old. He met Kathrine Wacker, also a native of Germany. They were married at Highwood, Illinois, in 1852, and went to Crawford county where they remained a few years and then came to Richland county. Mr. Unbehaun served in the Civil War as a cook. They became the parents of ten children. Came to America in 1848. He settled in Lake County, Illinois, north of Chicago. Private Co K 51st Wis Inf - Civil War. Henry Theodor Unbehaun immigrated in 1848. Name Variation Catharina Sophia Wacker was also known as Katharina. Married Name 1852 As of 1852,her married name was Unbehaun. Catharina Sophia Wacker was born on 21 September 1834 at Germany. She was the daughter of John Phillip Wacker and Maria Elizabeth Hardt. Catharina Sophia Wacker married Henry Theodor Unbehaun, son of Johann Nicol Unbehaun and Christina (? ), in 1852 at Highwood, Illinois. Catharina Sophia Wacker died on 30 December 1910 at age 76. 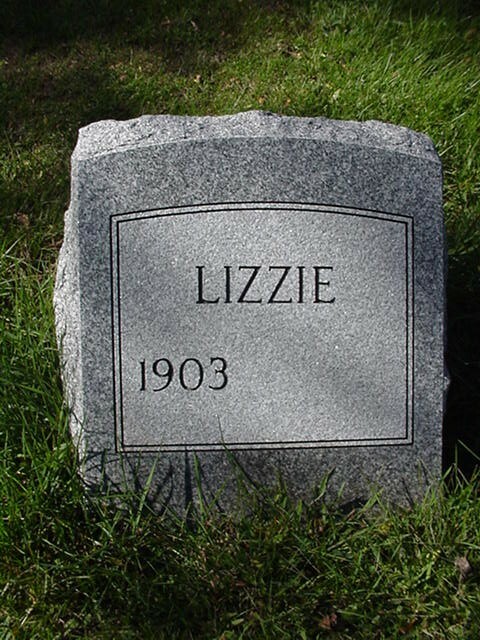 She was buried after 30 December 1910 at English Ridge Cemetery, Marshall, Richland, Wisconsin. Married Name 5 June 1936 As of 5 June 1936,her married name was Unbehaun. Loretta Cecelia Bosch was born on 2 October 1912. She married Dwayne Carl Unbehaun, son of Charlie Unbehaun and Lillie Modena Baer, on 5 June 1936. Loretta Cecelia Bosch died on 12 July 2000 at age 87. Her father born Anthony Perciabosco changed his name to James Bosk and later James Bosch. Loretta was born Bosk and married as Bosch. Harley Edward Unbehaun was born on 28 February 1907. Harley Edward Unbehaun married Nina H. Blickem on 24 July 1929. Harley Edward Unbehaun died on 15 February 1993 at age 85. He was buried after 15 February 1993 at Richland Center Cemetery, Richland, Richland, Wisconsin. 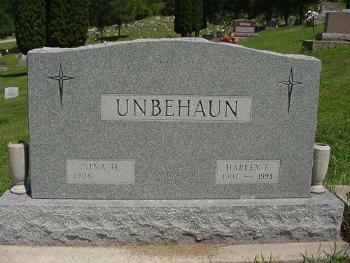 Married Name 24 July 1929 As of 24 July 1929,her married name was Unbehaun. Nina H. Blickem was born on 27 July 1906. She married Harley Edward Unbehaun, son of Charlie Unbehaun and Lillie Modena Baer, on 24 July 1929. Nina H. Blickem died on 23 May 2003 at age 96. She was buried after 23 May 2003 at Richland Center Cemetery, Richland, Richland, Wisconsin. Name Variation Elizabeth I. Pauls was also known as Lizzie. 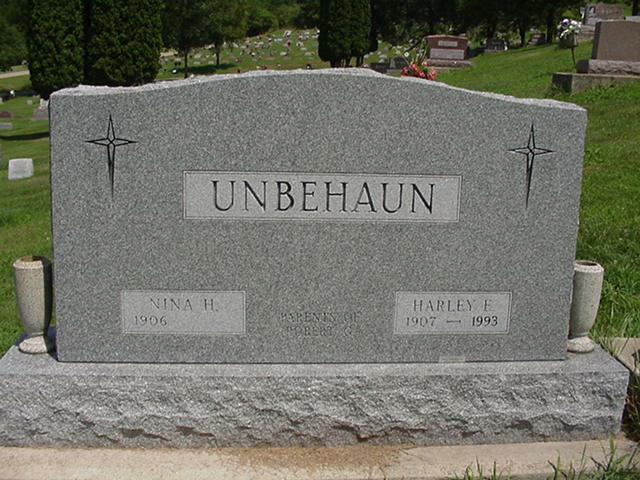 Married Name 11 November 1925 As of 11 November 1925,her married name was Unbehaun. Elizabeth I. Pauls was born on 18 June 1903. She married Roy M. Unbehaun, son of Charlie Unbehaun and Lillie Modena Baer, on 11 November 1925. Elizabeth I. Pauls died on 9 March 2006 at age 102. She was buried after 9 March 2006 at Richland Center Cemetery, Richland, Richland, Wisconsin. Married Name 18 October 1921 As of 18 October 1921,her married name was Ewers. Ada Z. Unbehaun was born on 22 September 1901. Ada Z. Unbehaun married Alvan William Ewers, son of Elihu Ewers and Ina Olpha Cooper, on 18 October 1921. Ada Z. Unbehaun died on 30 January 1979 at age 77. She was buried after 30 January 1979 at Richland Center Cemetery, Richland, Richland, Wisconsin. Alvan William Ewers was born on 16 June 1895. He was the son of Elihu Ewers and Ina Olpha Cooper. Alvan William Ewers married Ada Z. Unbehaun, daughter of Charlie Unbehaun and Lillie Modena Baer, on 18 October 1921. 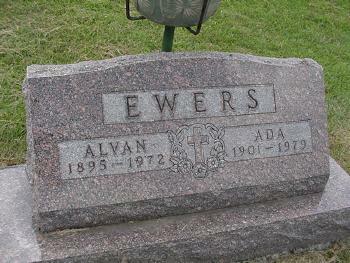 Alvan William Ewers died on 12 November 1972 at age 77. He was buried after 12 November 1972 at Richland Center Cemetery, Richland, Richland, Wisconsin. Elihu Ewers married Ina Olpha Cooper. Married Name Her married name was Ewers. Ina Olpha Cooper married Elihu Ewers. Name Variation Johann Nicol Unbehaun was also known as Nicholas. Johann Nicol Unbehaun married Christina (?). Johann Nicol Unbehaun was born in 1801. Married Name Her married name was Unbehaun. Christina (?) married Johann Nicol Unbehaun. John Phillip Wacker married Maria Elizabeth Hardt. Married Name Her married name was Wacker. Maria Elizabeth Hardt married John Phillip Wacker. Name Variation Elias Franklin Howe was also known as Ellis. Elias Franklin Howe was born on 17 February 1843 at Canada listed as "lower Canada." He was the son of Squire Howe and Lucina Humphrey. Elias Franklin Howe married Mary Jane Young on 22 March 1872. Elias Franklin Howe died on 25 May 1922 at age 79. [S248] U.S. Federal Census 1860 U.S. Federal Census, by Ancestry.com, Year: 1860; Census Place: Ithaca, Richland, Wisconsin; Roll M653_1428; Page: 133; Image: 141; Family History Library Film: 805428. [S247] U.S. Federal Census 1870 U.S. Federal Census, by Ancestry.com, Year: 1870; Census Place: Ithaca, Richland, Wisconsin; Roll M593_1734; Page: 640A; Image: 183; Family History Library Film: 553233. [S246] U.S. Federal Census 1880 U.S. Federal Census, by Ancestry.com, Year: 1880; Census Place: Ithaca, Richland, Wisconsin; Roll: 1445; Family History Film: 1255445; Page: 101D; Enumeration District: 236. [S245] U.S. Federal Census 1900 U.S. Federal Census, by Ancestry.com, Year: 1900; Census Place: Ithaca, Richland, Wisconsin; Roll: 1813; Page: 7B; Enumeration District: 0115; FHL microfilm: 1241813. [S244] U.S. Federal Census 1910 U.S. Federal Census, by Ancestry.com, Year: 1910; Census Place: Ithaca, Richland, Wisconsin; Roll: T624_1732; Page: 1B; Enumeration District: 0094; FHL microfilm: 1375745. [S243] U.S. Federal Census 1920 U.S. Federal Census, by Ancestry.com, Year: 1920; Census Place: Ithaca, Richland, Wisconsin; Roll: T625_2013; Page: 4B; Enumeration District: 201; Image: 211. Name Variation Mary Jane Young was also known as Minnie. Married Name 22 March 1872 As of 22 March 1872,her married name was Howe. Mary Jane Young was born on 27 April 1850 at Canada. She married Elias Franklin Howe, son of Squire Howe and Lucina Humphrey, on 22 March 1872. Mary Jane Young died on 14 August 1931 at age 81. Mary Jane Young had 4 with 4 living in 1900 children. Abel Humphrey married Deborah Riley. Abel Humphrey was born circa 1775 at Vermont. He died in November 1809 at Vermont. Married Name Her married name was Humphrey. Deborah Riley married Abel Humphrey. Deborah Riley was born before 1785. She died on 6 May 1843 at Vermont. Squire Howe married Phebe Pierce. Squire Howe was born on 2 November 1752 at Connecticut. He died on 6 February 1834 at Canada at age 81. 1) CAPTS BACKUS, TROTUNION, CHAMBERLAIN, MIL. Married Name Her married name was Howe. Phebe Pierce married Squire Howe. Phebe Pierce was born on 13 January 1760 at Plainfield, Connecticut. She died on 10 September 1848 at Canada at age 88. Name Variation Rufus L. Howe was also known as Rufus G.
Rufus L. Howe was born in 1837 at Canada listed as "lower Canada." Rufus L. Howe married Holliday (?) before 1860. Rufus L. Howe died in 1863. Enlisted in Company F, 2nd Cavalry Regiment Wisconsin on 18 December 1861. Discharged Company F, 2nd Cavalry Regiment Wisconsin on 24 September 1862 in Helena, AR. [S248] U.S. Federal Census 1860 U.S. Federal Census, by Ancestry.com, Year: 1860; Census Place: Ithaca, Richland, Wisconsin; Roll M653_1428; Page: 134; Image: 142; Family History Library Film: 805428. Married Name before 1860 As of before 1860,her married name was Howe. Holliday (?) was born circa 1830 at Canada. She married Rufus L. Howe, son of Squire Howe and Lucina Humphrey, before 1860. Married Name 1877 As of 1877,her married name was Cole. Mary F. Howe was born circa 1853 at Canada. She was the daughter of Squire Howe and Lucina Humphrey. Mary F. Howe married Byron Bradley Cole in 1877. Mary F. Howe died in 1889. Byron Bradley Cole was born in 1852. He married Mary F. Howe, daughter of Squire Howe and Lucina Humphrey, in 1877. Byron Bradley Cole died in 1904. Married Name 6 December 1866 As of 6 December 1866,her married name was Stoddard. Nancy Howe was born circa 1849 at Canada. Nancy Howe married John Washington Stoddard, son of Valentine Stoddard and Joanna Davison, on 6 December 1866. Nancy Howe died before June 1873. [S247] U.S. Federal Census 1870 U.S. Federal Census, by Ancestry.com, Year: 1870; Census Place: Ithaca, Richland, Wisconsin; Roll M593_1734; Page: 639A; Image: 181; Family History Library Film: 553233. Rufus Adelbert Stoddard was born in 1868 at Wisconsin. He was the son of John Washington Stoddard and Nancy Howe. Rufus Adelbert Stoddard died on 21 March 1933 at South Dakota. [S246] U.S. Federal Census 1880 U.S. Federal Census, by Ancestry.com, Year: 1880; Census Place: Morrison, Grundy, Iowa; Roll 341; Family History Film: 1254341; Page: 495A; Enumeration District: 238; Image: 0871. Married Name 22 June 1873 As of 22 June 1873,her married name was Stoddard. Susan Catherine Johnson was born on 18 November 1855. She married John Washington Stoddard, son of Valentine Stoddard and Joanna Davison, on 22 June 1873. Susan Catherine Johnson died on 15 December 1927 at Richland, Wisconsin, at age 72. Albert A. Howe married Ella M. Bly. Albert A. Howe was born circa 1850 at Canada. Albert A. Howe died before 1900 at North Dakota. [S247] U.S. Federal Census 1870 U.S. Federal Census, by Ancestry.com, Year: 1870; Census Place: Palermo, Grundy, Iowa; Roll M593_393; Page: 134A; Image: 271; Family History Library Film: 545892.